General Choi Hong Hi was born on November 9th, 1918, in the Hwa Dae Myong Chun District of Korea. At the age of twelve he started to study Taek Kyon, an ancient Korean method of fighting with the feet. In 1937, he went to Kyoto, Japan to study calligraphy. Choi had been studying calligraphy and Taek Kyon in Korea under Han Il Dong and upon arrival in Japan he started to study Shotokan Karate as a student of a Korean named Kim Hyun-soo, and after two years of intensive training he was presented with a first Dan Black Belt in Shotokan. He then went onto Tokyo University where he gained his second Dan. Around the same time, he started teaching, and became an instructor at the Tokyo YMCA. Conscripted into the Japanese army in 1943, he was posted to Pyongyang where he became involved in the Korean Independence Movement, resulting in his imprisonment. Wanting to maintain his good physical and mental health during his imprisonment, he practiced karate, alone at first, then by teaching it to the staff of the prison and the other prisoners. Until his liberation at the end of the war he practiced and developed much of his martial art. Becoming an officer in the new Korean Army after the end of the war, he continued to teach his martial art to his soldiers as well as to American soldiers serving in Korea. His beliefs and his vision of a different approach to teaching martial arts led General Choi to combine elements of Taek Kyon and Karate techniques to develop a modern martial art. He called it Taekwon-Do, which means "the way of the feet and the hands", and this name was officially adopted on April 11th, 1955. 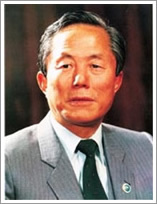 In 1959, General Choi was named President of the Korean Taekwon-Do Association. Seven years later, on March 22nd 1966, he created the International Taekwon-Do Federation (ITF). As the Founder of Taekwon-Do and President of the ITF, he had the ability to share his art with students everywhere. Today, Taekwon-Do training is available around the world. After a life dedicated to the development of Taekwon-Do, a modern martial art based on traditional values, philosophy, and training, General Choi, Founder of Taekwon-Do and President of the International Taekwon-Do Federation, died of cancer on June 15th, 2002, in the country of his birth.